If you miss crumbly goat's cheese, this is the recipe for you! It's based on this well-known recipe from the Vegetarian Times, but I bake it on a higher temperature, which gives it a firmer texture and a nicely browned 'rind'. This cheese can easily be cut into wedges or cubes. It tastes fantastic crumbled over salads, pasta and pizza. You can also just snack on it, or serve it as part of a fancy vegan cheese platter. Squeeze the soaked almonds to remove the skins. Add them to the jar of you foodprocessor or high powered blender along with the lemon juice, oil, garlic and salt. Puree the mixture into a smooth mass. Depending on the strength of you machine this can take a few minutes. Add extra water if needed to make the blending go easier. Put a colander on a bowl and cover it with a few layers of cheesecloth or a thin clean tea towel. Scoop the pureed nut cheese onto the colander. Fold the cloth around the cheese so it is squeezed into a ball. Let the cheese sit for 12 to 24 hours at room temperature so it can dry out and ferment a bit (this step is optional, you can also bake it right away). Preheat your oven to 200 C / 400 F and cover an oven rack or baking sheet with parchment paper. Take the cheese out of the cloth and place it onto the parchment paper. You can pat it down a bit to make a wheel shape. Smooth out any cracks or uneven patches. 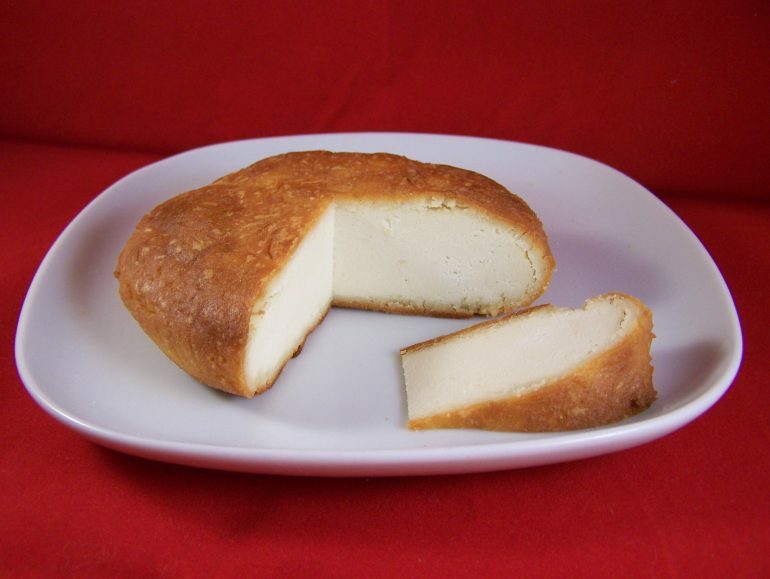 Bake the cheese for about 30 minutes, until it feels firm and has a golden brown rind. Let it cool and put it into the fridge to firm up a bit more. It will keep for at least a week in the fridge. Just look at the picture and I can't resist it. This recipe worths trying, thank you for amazing recipe! Hi Jan, there is enough fat in the recipe, so oiling is not required. No recipe video, sorry! Can you use almond flour for this? Hi Andi, I think you can, yes!